Lo Scricciolo is perfect as a country house for weekends and holidays, or timeshare for one or more families. For those who want to open a B & B, holiday house or agriturism. Historic building dated back to 1800, carefully restored, placed between Pisa and Florence. At the moment, it is used as a holiday home with a total area of 450 sqm on four levels. The property includes the plot of land of about 3500 sqm with olive grove, orchard, garden and terrace as well as a biological vegetable garden and a beautiful swimming pool. The prestigious farmhouse for sale in Tuscany is located in a quiet corner of the Tuscan countryside, in the province of Pisa in the village Montecastelli Pisano, on a hill between the Pavone stream and the Cecina river. It makes a part of the municipality of Castelnuovo Val di Cecina that stretches out to the Val d'Elsa. For its colors and the sweetness of the surrounding hills, it retains much of the Siena landscape. It is 12 km from Castelnuovo, an ancient center of Etruscan origin, important in the Middle Ages when it became a fortified village of the Pisa republic and is not far from the beautiful art cities such as Volterra 30 km, Siena 50 km, Florence 80 km and Pisa 90 km. Pisa International Airport and Florence Airport are both 80 minutes away by car. Ancient farmhouse of the end of the eighteenth century completely renovated in 1999. The building is spread over an area of about 450 sqm on four levels, in a panoramic position with a well maintained park with swimming pool and a plot of 3.500 sqm with olive grove and orchard. At the basement, there is a kitchen and dining room, an apartment, a covered panoramic terrace and stairs with access to the porch below and a pool. On the ground floor - entrance hall, apartments with kitchen, four bedrooms, three bathrooms and a storage room. On the first floor, there is a hallway, two living apartments with kitchen, three bedrooms and two bathrooms. On the second floor, there are two apartments with kitchen, four bedrooms, three bathrooms, storage room. 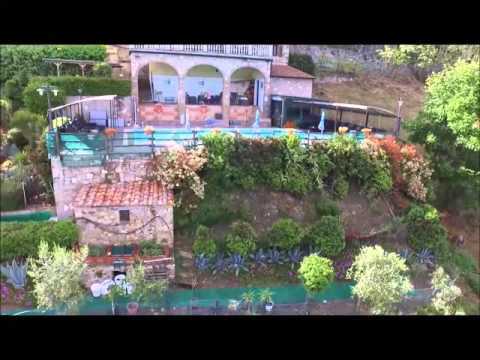 The prestigious palace for sale in Tuscany has been restored with great care in 1999. In order to provide a high standing and every kind of comfort there were used only high quality materials first-rate materials. The property has all necessary utilities like water, electricity and heating. For water supply, there is a connection to the municipal waterworks system. Heating is on methane gas. This country house for sale in Tuscany is regularly registered at NCEU for the municipality of Castelnuovo Val di Cecina, while the land plot - at NCT for the same municipality. The property is owned by a company. Potential Land Useaia offers an excellent opportunity. This is a well-established hospitality business.